Archos has launched the GamePad, the first dedicated Android console for gamers tired of prodding touchscreens. The GamePad aims to bring traditional control systems to modern mobile games and has a 7-inch 1024 x 600 five-point capacitive screen to accompany its 16 physical buttons and dual analogue sticks. It'll come packing Android 4.1 Jelly Bean device, will have full access to the Google Play store and is available to buy in the UK from today for £129. There's no word yet on international pricing. The French company said the GamePad will fill the needs of casual gamers who enjoy the ease and relatively low cost of playing mobile games, but don't enjoy using the touchscreen exclusively. "Android device users spend more than 9 hours a month gaming on their devices and yet are not completely satisfied with the touch-screen experience," said Archos founder and CEO Henri Crohas. "We feel this area of gaming is proven and will continue to grow. With the introduction of the GamePad we are uniquely positioned to feed the demand of gamers who want a better gaming experience on a tablet." In the engine room, the GamePad has a 1.6GHz dual-core processor, 8GB of internal storage and an SD card slot for an additional 64GB. The Archos GamePad also features a unique Game Mapping tool, which allows users to convert titles that weren't made for the physical controls. The on-screen buttons can be easily mapped to any of the physical buttons as demonstrated in the video below. 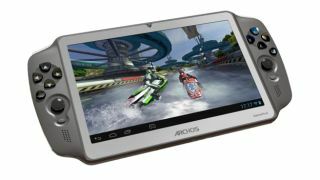 The launch of the GamePad is Archos' latest attempt to plant a flag in the niche tablet market. Just last week it released the 10-inch FamilyPad, which encourages families to gather round, play digital boardgames and watch movies together. Archos said the GamePad will be available stateside during the first quarter of 2013, and we'll keep a look out for pricing and an exact release date.